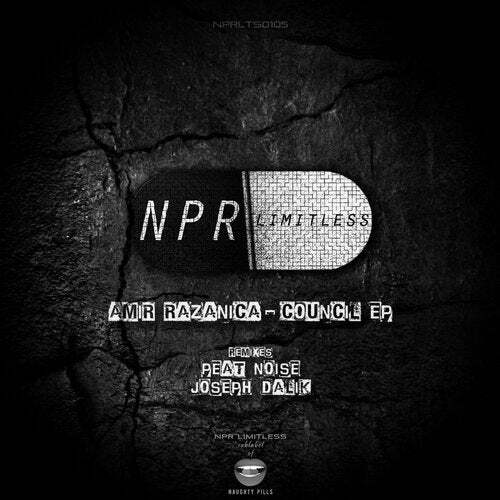 After countless hits on Naughty Pills Records, our good friend and a very talented producer, Amir Razanica makes his debut on our sublabel, NPR Limitless. When it comes to Techno Amir is one of the most straight ahead guys we know. He's all about the hard, powerful kicks and of course the bass. Also he fills up his tracks with his trademark highs which makes it hard for you to stand still when you're listening to them. We also have a couple of remixes from other two Naughty Pills / NPR Limitless regulars, Peat Noise and Joseph Dalik. Our owner Peat brings a really dark and deep version of Council while Joseph made Empty Rack his own, with his punchy, groovy sounds.